I include it because this English water spaniel because, except for color and the docked tail, this animal reminds me of a heavily-built golden retriever. It doesn’t remind me of a more-lightly built golden, but something about Quaille that says he could make it as a show golden. At a distance he also could remind one of a Welsh springer spaniel. In fact, it is well-known that the water spaniels were absorbed into several spaniel breeds, including both breeds of springer. One of the founding dogs in the field spaniel studbook was a cross between a cocker (English) and English water spaniel. He was listed as a Sussex spaniel only because he was liver in color. That should tell you that the term Sussex spaniel was a much broader term than it is today. After all, one of the leading characteristics of English water spaniels is they had MORE leg length than most land spaniels. The modern Sussex spaniel has very short legs, and for a while, virtually all field spaniels were short-legged. They looked a lot like long-haired dachshunds with docked tails. 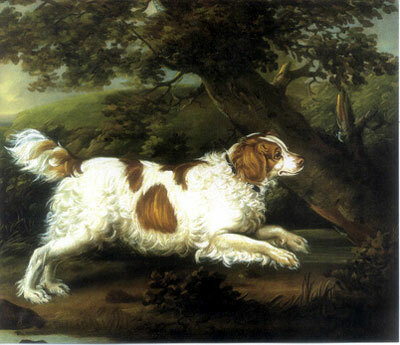 I’m preparing a post on the history of field spaniels. It will be posted early to the middle of next week. What the heck was the Norfolk retriever? This depiction of an English water spaniel comes from Stonehenge's The Dog in Health and Disease. It is one of the ancestors of the Norfolk retriever, and it may be the ancestor of some of the proto-retrievers. The colour is more often brown than black, and the shade of brown rather light than dark – a sort of sandy brown, in fact. Coat curly, of course, and the curls hardly so close and crisp as in the show retriever of the present day, but inclined to be open and woolly. The coat is not long, however, and across the back there is often a saddle of straight short hair. In texture the coat is inclined to be coarse, and it almost invariably looks rusty and feels harsh to the touch. This, however, may in some measure be due to neglect. The head is heavy and wise-looking, the muzzle square and broad; ears large, and somewhat thickly covered with long curly hair. The limbs stout and strong, with large and well-webbed feet. The tail is usually docked like a spaniel’s, but not so short. This seems to be quite a keeper’s custom, and probably originated from the fact that, to an inexperienced eye, the tail of a puppy generally appears too long for the dog. However, although docking the tail improves the appearance of a spaniel, in my opinion it completely spoils the symmetry of a retriever. I remember once asking a Norfolk keeper’s opinion of a very handsome flat-coated retriever I had. After examining the dog carefully, the man said, ‘ Well, sir, he would be a rare nice-looking dog if you only cut half-a-yard off his tail.’ I need hardly add that I did not act on the suggestion. When white appears on the chest it is more frequently in the form of a spot or patch than a narrow streak. They are usually rather above than below the medium size and are strong compact dogs. As a rule, they are exceedingly intelligent and tractable, capaple of being trained to almost anything, both in the way of tricks and with the gun. In temperament they are lively and cheerful, making excellent companions; and it is very rarely that they are found sulky or vicious. When only half-trained they are apt to be headstrong and impetuous, and, though naturally with a strong retrieving instinct, are often a little inclined to be hard-mouthed. This defect can be traced to two causes. It may be the rusult of injudicious breeding from hard-mouthed parents, or it may arise from careless or slovenly handling in their young days. However, when they are wanted almost exclusively for wildfowl shooting, this failing is not of so much moment, for they will be principally used for retrieving birds that fall in the water, and, as fowl are for the most part very tough birds, the rough grip as a dog seizes a duck will not cause much mischief, and while swimming the most inveterate “biter ” will seldom give his birds a second nip. For wildfowl shooting they are admirable. These dogs remind of a breed in Australia called the Murray River Curly-coated retriever. This dog was developed along the Murray River to retrieve shot waterfowl. Its ancestors are believed to be the more curly-coated retriever that developed in Britain, the Irish water spaniel, and the wavy or flat-coated retriever. I’ve suggested that maybe the Norfolk retriever had some role in developing the Murray River curly, simply because the descriptions are so similar, except that Murray River curlies are not docked. Saxon believed the Norfolk dog was derived from taking the English water spaniel and breeding it to the Labrador (St. John’s water dog). This cross was more common in British retrievers than one would think. 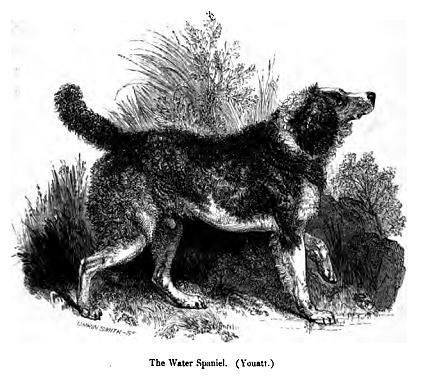 After all, the so-called Tweed water spaniel, was mostly a cross between an indigenous strain of water spaniel and the “Newfoundland” dog (St. John’s water dog). The modern breed called curly-coated retriever is believed to have developed through cross-breeding water spaniels and St. John’s water dogs. Indeed, this cross-breeding had to have been commonplace. If one reads any literature on water spaniels, the dogs are very common throughout Great Britain and Ireland until about the middle of the nineteenth century. Then, the dogs begin to disappear. The word retriever starts to replace them in the literature, and it is very likely that the dogs themselves were being replaced. The curly-coated retriever was promoted as a show dog in the early fancy. Although it did not have the patronage of the flat-coated retriever, it was not well-publicized as a working dog. The curly was often denounced in sportsmen’s literature as being inferior to the flat-coat. In the end, it really didn’t matter. The Norfolk retriever is no more. I cannot find any references of the breed later the First World War. And there are still questions about what it exactly was. Maybe it didn’t go extinct after all. Maybe it is an ancestor of the Murray River curly. Maybe it was absorbed into the modern curly. In fact, it might be that the Norfolk retriever was the last of a surviving line of British water dogs– some of them called water dogs and some called water spaniels– that were actually ancestral to the modern retrievers and the St. John’s water dog. I find this possibility a bit more interesting, but it is also one that Dalziel and his “experts” didn’t explore. And it’s a shame that they didn’t. If you were to ask most people who have some expertise in writing style what they prefer to read, you would most likely hear that they want “tight” writing. I’ve never been able to write tightly. I can’t do it. I’ve given up on that endeavor long ago. I’ve decided to work harder on clarity instead. Clarity is the key. If a person cannot understand what you’re writing, it doesn’t matter what your style is. Perhaps I would be able to write in that tight style if I had a different brain. For me to have clarity in my writing, I have to use lots of verbage. My rough drafts are always full of extraneous words, but when I go to hacking away at the sentences, I always feel that my syntax starts to confound the reader. Now, I am good with sentence structure. If you like compound, complex, and compound-complex sentences, I’ve got lots of them. But waiting for me to write like Ernest Hemingway is a bit like waiting for cat to bark. An iguana that goes into very cold ocean water to eat seaweed. That’s got to be one of the strangest things to have ever evolved. 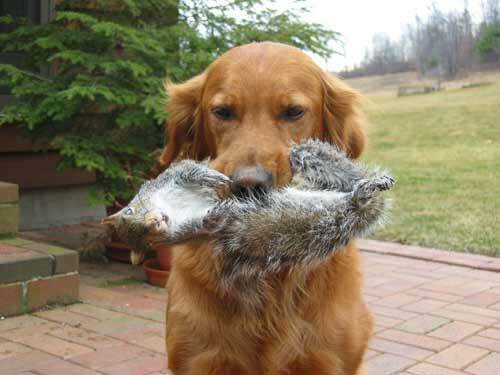 Golden retrievers were bred to carry dead things in their mouths. If you’ve decided that you would like to have a golden retriever, you owe it to yourself to consider if your lifestyle, personality, and aesethic sense really match the main characteristics of this breed. Too many dogs are purchased without considering their innate drives and inherited tendencies toward behavior, and as as result, too many dogs are given up to shelters and rescue organization. We owe to the dogs to consider these things very carefully before we bring one into our homes. I think now I will lay out some possible negative characteristics of the golden retriever. However, shedding isn’t the only way goldens can make a house messy. Many goldens don’t like swimming. However, I have yet to meet one that didn’t think mud puddles were the perfect place to lie down. Younger dogs in particular like playing in mud puddles. If you live somewhere that receives regular rainfall, you are going to have to worry about the dogs getting muddy. I have also not yet met a golden that didn’t enjoy rolling in stinky substances. The ethological term for this behavior is called “self-annointing.” There are several theories about why dogs do this behavior. One suggests that dogs do it because wolves used to roll in stinky substances as a way of camouflaging their own scent. However, I’ve always felt that this had stronger basis in the social behavior and “aesthetic senses” of domestic dogs. I think dogs view scents in much the same way we view beautiful landscapes. To a dog, a rotting carcass can be as moving as viewing the Grand Canyon is to us. When we go to the Grand Canyon, we take photographs to show our family and friends. When dogs come across an “aesthetically pleasing” scent, they self-annoint, so they can share this odor with their packmates. For some reason, goldens like doing this more than any other breed I’ve been around. They really like to self-annoint. Of course, if your dog is going to live in the city, it is very unlikley that the dog will have a chance to get very muddy or ever have the opportunity to roll in something disgusting. However, that whole premise starts another problem. Not all goldens are good urban dogs. In general, the European show-type goldens are a better candidates for city life than any working-bred dog. However, even the show-type dogs require a bit more excercise than the normal dog, and it is not wise to even consider keeping the working-bred dogs in an urban environment, unless you can walk them six hours a day. For those of you who have seen Marley & Me or read the book, the real problem the Grogans had was they were keeping a working- bred Labrador retriever in an urban environment. These dogs need more stimulation for their minds and bodies than the typical dog, and if you leave one locked up in a house all day, your furniture probably won’t be in one piece when you get back. Golden retrievers can have what can best be called an “oral fixation.” These dogs have been selectively bred to put things in their mouths. As puppies, many working bred dogs will start to engage in the full retrieving behavior at a very early age. Not all goldens will develop the instinctive retrieving behavior, but if you buy a working bred dog, the chances are very high that the dog will start retrieving with very little encouragement. However, even those dogs that don’t retrieve will develop some rudiments of the behavior. Lots of goldens will bring objects as a greeting behavior. Now, all of this sounds good, but no dog is born knowing what it can retrieve or carry in its mouths. It is very common for young retrievers to steal laundry, which almost always involves the dog running off with underwear. And then eating it. These dogs are generally very social. Most goldens have never met a stranger. They really like people and other dogs. These dogs are not typically loyal, as you might describe the word. If these dogs can escape and wander the neighborhood looking for friends, they will. Not all goldens will do this, but virtually all male goldens will wander, castrated or not. If you live an area where free roaming dogs are not allowed or where free roaming might be a death sentence for the dog, you probably want to have something to keep the dog on your property. This is not the healthiest breed. 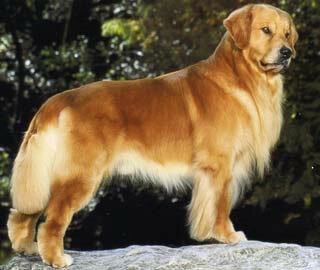 At one time, this breed was known for being the longest lived of the retrievers. Bruce Fogle’s Encyclopedia of the Dog (the original edition) listed this breed’s life expectancy at 13 to 15 years. (He may have been inflated the breed’s life expectancy a bit. He is, after all, totally smitted with golden retrievers.) However, depending upon the line and the survey you are using, the life expectancy is now somewhere between 10 and 13 years. Now, that’s better than the bulldog, the St. Bernard, the Irish wolfhound and the Dogue de Bordeaux. This breed has real problems with cancer. Hemangiosarcoma and lymphosarcoma are estimated to account for about half of all deaths in the breed. Hip and elbow dysplasia, juvenile cataracts, progressive retinal atrophy, eyelid and eyelash abnormalities, pigmentary uveitis, immune and autoimmune diseases, von Willebrand’s disease, hypothyroidism, hyperthyroidism, Subarterial Aortic Stenosis, Mitral Valve disease, swallowing disorders, and allergies to all sorts of things are known disorders in the breed that are at least thought to have a genetic basis. ( Of course, many of them have been fully proven to have a genetic disorders.) I am sure I am leaving out some disorders. The list grows every year. The genetic diversity of the golden retriever is not very good, and this problem has been exacerbated through the overuse of a few sires in the gene pool and the balkanization of the gene pool around performance and show lines. These disorders have happened because of poor breeding practices, but another problem has popped up in recent years that also can be blamed on the poor selection of breeding stock. This breed has a reputation for being gentle and friendly. These dogs are very tolerant of other dogs, and I have known one to let the other dog chew on the other end of a bone she that she was also chewing. However, many of these dogs have lots this tolerance. Possessiveness has become a well-known behavioral problem in golden retrievers. Many dogs won’t let people near their bones, or they commandeer certain areas of the house (such as their beds or furniture). Now, such behavior is a total rejection of the proper behavior of a working retriever, which readily give objects in their mouths to their human handlers. This behavior seems to have some basis in inheritance. Some lines produce rather possessive dogs, while others do not. Dog aggression is another behavioral problem that seems to be on the increase in this breed. This problem is also a deviation from the traits needed in a working retriever, for working retrievers often work in close proximity to strange dogs. Now, if you’ve considered all of these issues very carefully and you think you are up to it, you need to work on finding a dog that meets your needs. With this breed, there is quite a bit of variance between show and working lines. Show dogs have a lot more coat to care for than working-line dogs do. However, working line dogs require a lot more mental and physical stimulation. In addition to the commonly characterized lines, there are many, many goldens that are considered “pet-line dogs.” These animals are often a mixture of the various types, and because of this, it can be hard to determine what you’re going to get. In one litter you could have a mellow, cream-colored European show-type pup that has a litter mate that is a red retrieving fool. The vast majority of goldens are actually this type, and because of this, one needs to be a little careful in choosing a dog from a “non-specialized” litter. You could wind up with a barmy retriever that can’t stand being shut up all day. With popular breeds, choosing a dog is often far more complicated than choosing a rare breed. With rare breeds, you are almost guaranteed that the breeder will be somewhat knowledgeable about the animals. Finding someone who actually knows something about the breed is often harder than you would think. Of course, you may have to wait longer to get one, and if you want a working animal, the rare breeds are often inferior to the more popular ones. However, if you are willing to give a golden retriever what it needs and put up with its negative characteristics, the golden retriever might be for you. Choosing a dog requires careful consideration. If everyone would take some time to research dog breeds, conflicts between dogs and people would be greatly reduced. And that’s why it’s a good idea to think this through. This python is a Borneo bateater. What? You made that up! No. That’s the trade name for a hybrid between the very common Burmese python and the reticulated python. It is a pretty good trade name. African rock pythons have an even broader range than the Indian python. Their range includes virtually all of Sub-Saharan Africa south to South Africa and Namibia. The original southern terminus of the range was KwaZulu-Natal, which actually has a very temperate climate. That means that it is more cold tolerant than the Burmese python, which makes it only as far north as the tropical/subtropical transition region of China. And if there were more African rock pythons in captivity in this country, I would be would be more concerned. But there may be lots of limiting factors that would prevent them from taking over the subtropical parts of the US. In fact, I think that I was wrong to think that the Burmese pythons would take over the US. Long-time readers of this blog, might remember this post where I linked to the US Geological Survey’s forecast for Burmese python range expansion. I was accepting of the findings, but then I read this study. It seems that South Florida is about the only place where Burmese pythons could live in the wild in the US. And even if we accept that climate change models as being valid, climate change actually reduces the suitable habitat for the Burms. So claims that Burmese pythons are going to colonize New Jersey are probably not accurate. However, I have yet to see any analysis on the potential range of the African rock python or a potential African rock python/Burmese hybrid. Maybe they could be better adapted to colonizing the US. Now, the Borneo bateater isn’t a hybrid between the Burmese python and the African rock python. It is a hybrid between the Burmese and reticulated python. It is possible that the retics could colonize South Florida, and they are much more common in the US pet trade than African rock python. And in case you didn’t know, the retics are the longest species of snake, approaching nearly 30 feet in length. 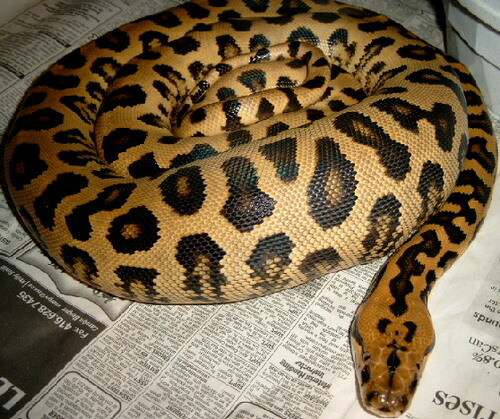 Pet retics have killed their owners, as have several Burmese pythons. That’s why owning one requires a certain level of caution and a great deal of knowledge. These animals deserve more than to be treated as curiosities and symbols of machismo. They need enlightened owners who can provide them with what they need. I do not oppose python ownership, but I really wish more was done to ensure that these animals were in the right hands. And I say this from this perspective: I’ve always thought these animals were cool, but I don’t know enough about caring for them to really provide the right home for one. I think feeding them full-sized rabbits would get expensive after a while.